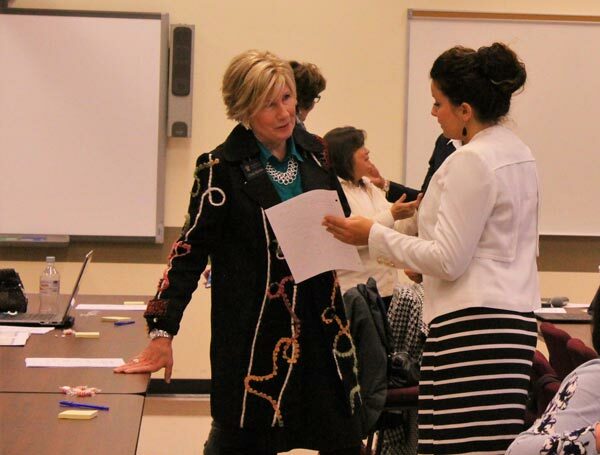 Dr. Cindy Kiernan, dean of the Price School of Education, speaks to an attendee at a training session held by Kiernan and her staff for Cherokee County School District administrators and collaborating teachers. Cherokee County School District administrators and collaborating teachers listen as Dr. Cindy Kiernan, dean of the School of Education at Reinhardt, host a training session on Reinhardt assessments, edTPA and co-teaching. According to reports released March 10, the first round of Spring 2016 edTPA scores for students from the Reinhardt University Price School of Education show a 100 percent pass rate. The edTPA is a new assessment implemented in the 2015-16 school year and is a requirement for certification of teacher candidates. It is geared at not only showing that student teachers have mastered what they learned in the collegiate classroom but that they are highly effective teachers of preschool through 12th-grade. The first round of assessments for Spring 2016 were submitted by the Price School of Education’s Master of Arts in teaching (MAT) students. The edTPA was developed by Stanford University faculty and staff at the Stanford Center for Assessment, Learning and Equity. Georgia is one of about a dozen states that require edTPA assessments. The test’s three components require the candidates to submit video of them teaching in the classroom, as well as evidence of their lesson plans and examples of assessments they have created for students which are subject to review by national scorers. EdTPA includes 15 rubrics for the middle grades. Each rubric can have a score of 1 through 5. Teachers are required to score 38 out of 75 to pass and receive their state certification. For elementary grades, there are 18 rubrics with a total score of 90. Students must attain a 42 to pass the exam. 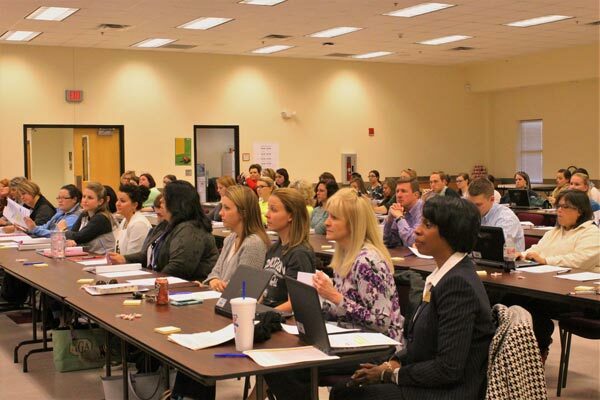 Previous to the edTPA assessment, Georgia’s beginner teachers needed to pass the Georgia Assessments for the Certification of Educators test (GACE) after they completed either an education degree program or non-traditional preparation program. The GACE exam was in addition to their student teaching. Now, in their last semester of college, known as Clinical Residency (formerly student teaching), students must take the edTPA, two GACE exams and two ethics exams. One of the GACE exams and one of the ethics exams are admission level and must be completed for admission into the education program. Kiernan said Reinhardt implemented the edTPA assessment in Fall 2015 at which time it became consequential. The Price School of Education is hosting two Master of Arts in Teaching (MAT) open houses next month. They are scheduled for April 12 at 6 p.m. at the North Fulton campus and April 14 at 6 p.m. at the Waleska campus and will be led by Dr. Pam Colvin, Reinhardt’s MAT Program Coordinator. For more information on the Price School of Education, contact Kiernan at (770) 720-5889 or cmk@reinhardt.edu.